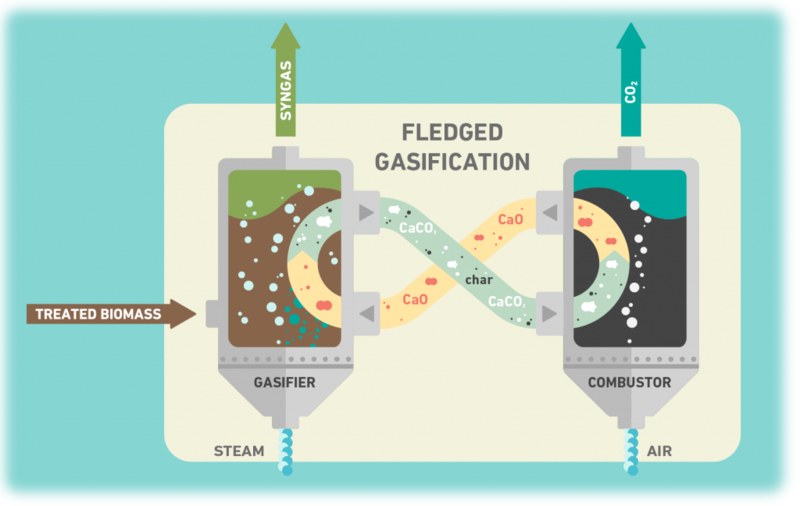 FLEDGED project addresses a gasification concept based on indirect gasification in a dual fluidized bed system using a CaO-rich bed material. Pre-treated biomass is gasified by steam and heat is supplied by hot solids from an air-blown combustor. production of a N2-free syngas with no need of pure oxygen, which would require a high cost and energy consuming equipment. in-situ CO2 removal by conversion of CaO bed material into CaCO3 to obtain tailored syngas composition. Low-tar syngas production thanks to the catalytic properties of CaO towards tar cracking. Flexibility in gasifying different types of biomass. Flexibility in adjusting syngas H2/CO/CO2 content when hydrogen from renewable energy sources is available, supporting a Power-to-Liquid conversion. Possibility of integrating Carbon Capture and Storage (bio-CCS), by feeding the combustor with high purity oxygen. A reduced syngas purification and conditioning section is then required.